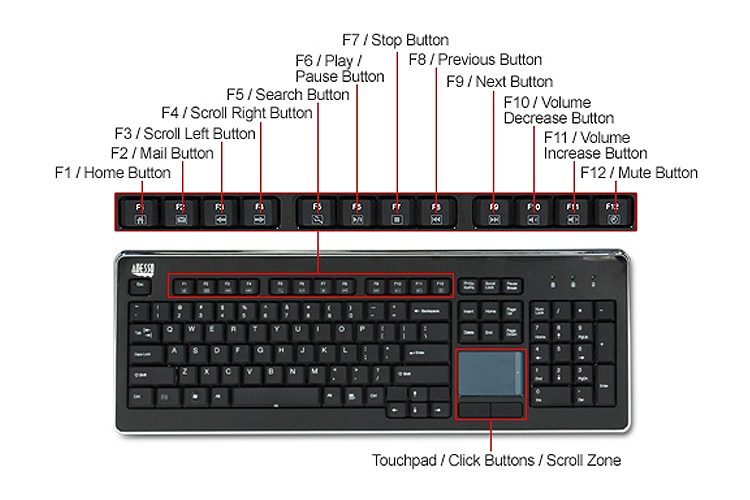 The SlimTouch Desktop Keyboard features an integrated touchpad with GlidePoint touchpad technology. The touchpad can take the place of your mouse, making it easier to control the movement of the cursor in your personal computer. The keyboard features low profile quiet tactile membrane keys and has an elegant sleek design with metallic accent. The SlimTouch Desktop keyboard is a low profile keyboard with a slim and stylish design, featuring a chrome and shiny piano finish. It also compliments the looks of most desktop devices, such as TVs or LCD monitors. Hotkeys on the keyboard allow users to connect directly to their favorite Internet or multimedia programs. With a single touch, users can surf the Web, navigate music and video clips, and start many frequently used programs.